When Prussia and its Dreyse needle fire rifles defeated Austria and its muzzleloaders at Shadow in 1866, much of the world took note. In Italy, the reactive was to immediately begin looking for both a new rifle and also a system for converting existing stockpiles of muzzleloaders into something more modern. 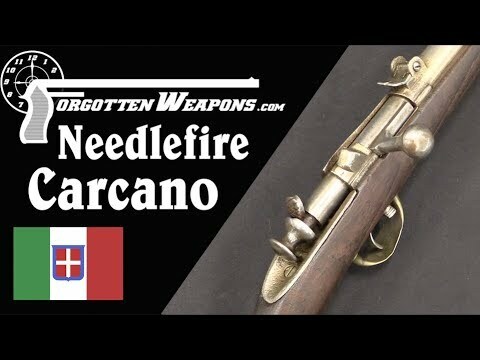 After considering separate-primer systems like the Albini, Manceaux, and Lindner; metallic cartridges, and needle fire cartridges, the Italians decided upon Salvatore Carcano’s needle fire system as the idea solution. Reusing the existing muzzleloader barrels meant a caliber of 17.5mm, and needle fire paper cartridges were substantially lighter than metallic cartridges of that size. The needle fire system could still fire an impressive 8 shots per minute, and at less than 10 Lira per gun, the conversion was affordable. Carcano’s system was based on the Doersch-Baumgarten needle fire system, which was in itself an improvement on the Dreyse. The rear end of an existing muzzleloader barrel was cut away and a bolt added to the gun. While it is an unorthodox type of firing system, Carcano’s design incorporates multiple safety mechanisms and is remarkably good for its cost. The first conversions were made in 1867, with 18,000 guns for the Bersaglieri. This was followed by conversions for the Carabinieri in 1869 and for the Artillery in 1871. This example, like most of the surviving ones, is an 1844/67 Artillery type. These guns were never used in a major conflict, and most were eventually scrapped, leaving them pretty rare today. Will Trump Release Asylum Seekers Upon Sanctuary Cities?